Line up: Liu Fang (pipa solo or with guzheng) plus 1 manager. 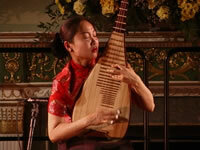 Liu Fang has achieved an international reputation for her masterful and deeply spirited pipa playing. Born in 1974 in Kunming in the Chinese province of Yunnan, Liu Fang began studying the pipa at the age of six and gave her first public performance as a pipa soloist when she was nine. In 1985, she played for Queen Elizabeth during Her Majesty's visit to China. Honoured with several provincial and national prizes, Liu Fang graduated from the Shanghai Conservatory of Music, where she also studied the guzheng, a Chinese zither. After moving to Canada in 1996, Liu Fang has built a remarkable artistic profile by captivating audiences and critics with the richness and grace of her playing as well as her wide ranging repertoire. Among the numerous solo recitals, concerto performances and concerts at festivals throughout Canada, the U.S., Europe and South America, Liu Fang has premiered new compositions by the celebrated Canadian composers R. Murray Schafer and Melissa Hui. She has appeared in the spectacular world premier of R. Murray Schafer’s musical drama The Palace of the Cinnabar Phoenix, playing outstanding solos on both the pipa and the guzheng. She has also collaborated with traditional master musicians from India, Japan, Syria and Vietnam. She performed two concerti for pipa and orchestra with the Moravia Symphony Orchestra in Prague (1999), and performed with the renowned Nouvelle Ensemble Moderne and SMCQ in Montreal, the Alcan string quartet in Quebec, and the Quartetto Paul Klee Venezia in Italy. She has also been collaborating with Malcolm Goldstein, an internationally renowned violin maestro, on new and improvised music. In 2003 Liu Fang was invited as a featured artist by BBC World Service for a concert on November 7, 2003 dedicated to World AIDS Day. The recording of this concert was broadcast in all of the 43 World Service Language Services with the current World Service audience across all platforms in the region of 150 millions. In 2004 she performed with great success at the WOMAD festival in Reading, UK. Aside to a well received solo performance she took part in a spectacular gala performance with musicians from around the world including Yair Dalal (Israel) N'Faly Kouyate (Guinea) and the UK Chris Difford, best known as the frontman and songwriter of Squeeze. Her recent performances include Bath International Music Festival (2005) Zagreb World Music Festival (2005) and Tanz and Folkfest Rudolstadt Germany (2006). Liu Fang has also made numerous national and international radio recordings and television appearances, given performances recorded for films, and released six CDs. 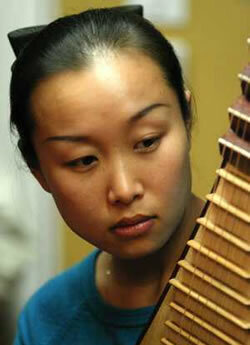 Acknowledged as a world class player of the pipa, less known is her command of the guzheng, the Chinese zither. Her most recent release, Le Son de Soie- Silk Sound (Accords Croises) features three tracks of the eleven played on guzheng. This album received rave reviews worldwide including being selected as the monthly choice ‘playlist’ for fRoots magazine who said ‘Liu Fang’s total devotion to her playing has moved her beyond perfect execution to the creativity and flexibility that marks a true musician”.